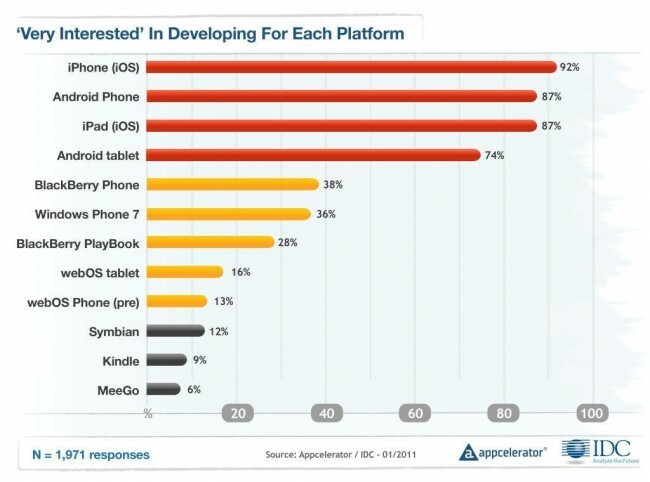 App developers interested in multiple platforms and tablets. Consumers made Android the most popular mobile brand in the fourth quarter last year. Obviously, the general public is excited about Android. But what do app developers think? A report released recently by Appcelerator glimpses into the minds of app developers – whose creative drive and financial success will factor heavily into the continued expansion and improvement of clinically-useful apps on all mobile platforms. This year, developers and businesses expect to triple their app development efforts and the average developer is now building for four different devices. This report reveals the brands and devices capturing the interest of app developers and outlines their perspectives on the emergence of tablet technology. App developers in this survey showed continued, strong interest in the iPhone and iPad as well as Android phones and tablets. The iPhone remains a priority for the vast majority of respondents, with 92% of nearly 2,000 developers ‘very interested’ in developing. The interesting, good news for users of other platforms is that many of the same developers are ‘very interested’ in venturing into new platforms. Instead of brand allegiance, this year’s survey shows increasing focus on a multi-platform strategy. The second great sign for the future of mobile apps is that app developers are expressing their desire to expand development efforts. Developers plan to for an average of 6.5 new apps this year, up 183% from last year. App developers are increasingly interested in developing apps for tablets. Interest in tablets does not appear to replace, but rather supplement, their interest in smart phones. While iPad interest remains very high (87% very interested), this year’s report shows increasing competition for the attention of app developers coming from other platforms – particularly the dozens of Android tablets available now or soon-to-be released (74% very interested). 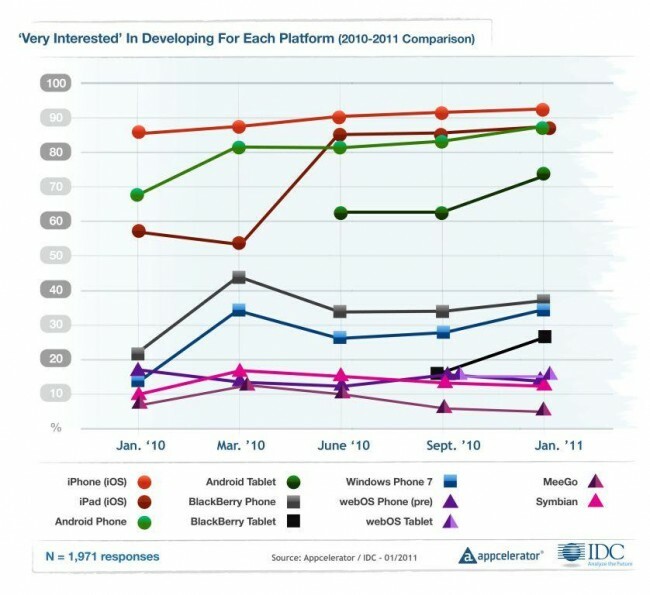 Interestingly, BlackBerry tablet interest has almost doubled in the last 15 months. App developers are changing the way they do business. The survey describes the evolution from an exploratory model—with a focus on free apps—to a new strategy: acceleration and innovation. Part of sustainable change involves testing different models for making money – including new advertising and in-app purchasing. What does this mean for medical app consumers? Apps – including medical apps – will change as the app development companies expand and mature. Expect to see more apps available on all platforms, and don’t expect Android’s dominance in consumer sales to diminish app developer’s drive to create great apps for the iPhone and iPad. On the contrary, the increased popularity of the entire smart phone market and exploding interest in tablets should fuel innovation across the board as app developers transition from single- to multi-platform development. Expect to pay for more apps. Users of some medical apps—e.g. Skyscape or Epocrates—are accustomed to paying for premium content. In the future, app developers will find new ways of making money, thus staying financially sustainable. Whether by increasing app purchase price, expanding advertising capability, or designing more ways to spend money within the app, we would expect that app users will be faced with more ‘opportunities’ to spend money. With all the headlines in this blog and others, one would think Android is doing a lot better than it really is. Reading beyond the headlines of this and other recent posts on iMedicalApps, I think you will find our enthusiasm is quite moderate and realistic. is on many more phones than iOS. Lol, This article is misleading. AppCelerator is a multiPlatform mobile application framework and its applications are only for common denominator. And this survey is ONLY applied to its framework users, so you can’t generalize result of this survey to all Mobile App Developers. And claiming that App Developers develop for 4 platforms on average is beyond the reality for the developers that uses native/default development tools. I have neither met nor read about such a developer that is diligent enough for 4 platforms!!!! I am a fan of your page, however, since this article is based ONLY on the AppCelerator developers, this doesn’t make any sense for the most of the developers on the market. I would expect you to state this in your article FOREMOSTLY.